Mr Boonchuey Kulsriworachai, owner of Siam Beach Resort in Koh Chang, has reached an agreement with National Park chief, Mr Veera Khunchairak and Pol Col Arwat Pibulsawat, superintendent of Koh Chang police over disputed title deeds in the ongoing land encroachment case. Under the deal, Mr Boonchuey has agreed to forgo ownership rights on parts of his 58-rai of land at the northern end of Lonely Beach, if the government and local authorities can prove they encroach on National Park land. 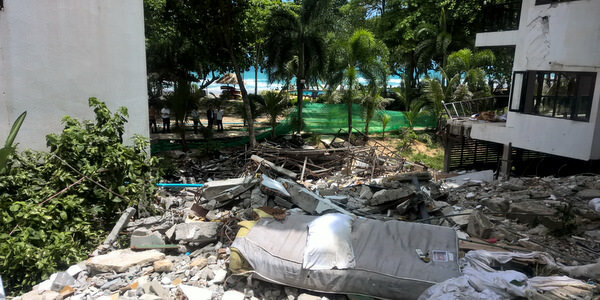 Siam Beach Resort came under intense scrutiny earlier in June, when one whole accommodation block collapsed after heavy rain, causing the death of one Thai tourist and injuring five others. Initial investigation by the Council of Engineers out of Bangkok and Trat Public Works and Town Planning Department revealed substandard construction practices, with the buildings, built on reclaimed swamp land, succumbing to entirely predictable soil erosion. Records of the approved buildings’ plans were lost to a flood a few years ago, but on-site analysis by the engineering team this month exposed elementary construction errors, including woefuly inadequate pilings and foundations. Though currently closed as a result of the collapse, the other 5 blocks in that area of the hotel have been recommended for demolition by the authorities. Meanwhile, the Land Office, working alongside the other departments, also highlighted apparent irregularities in the property land deeds. According to the owner, Mr Boonchuey, the whole plot, passed down to him from his father, was issued with Nor Sor Sam Kor accreditation before the establishment of the National Park in 1982. However, this is being questioned for encroachment by the relevant Park officials and as gesture of goodwill, Mr Boonchuey has announced his willingness to return the disputed land to the State, if the case goes against him. The other parts of Siam Beach Resort currently remain open for bookings.